The raw product from Demonstration of nitrobenzene is sufficient. One can also use other metals aside from aluminium, e.g., tin or iron. The acid concentration should be adjusted according to the fineness and activity of the metal. Safety goggles! Ventilation! Avoid contact with the reaction solutions! Extinguish the burner when not used (hydrogen production!). Add a spatula-tipful metal grits to the test tube. Then add 5 drops nitrobenzene. And then add approx. 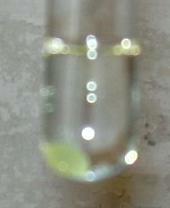 3 ml hydrochloric acid. In order to start the hydrogen production one can if necessary warm the mixture somewhat. If further necessary do this occasionally during the reaction. Ever again one sways the test tube back and forth and observes how the mixture clouds up yellowishly and then finally become a light brown, a process which can easily take 15 minutes. Dependent on the reaction process the nitrobenzene disappears more or less completely. For the verification of the aniline produced one adds into another test tube a small spatula-tipful 2-naphthol, prepares a slurry by adding approx. 0.5 ml diluted hydrochloric acid and then adds 4-5 drops of diluted sodium nitrite. An orange colors results. To verify the solution one now adds 4-5 drops of the reaction solution and then adds a few seconds later approx. 1 ml diluted sodium hydroxide solution. A cloudy, deep red color results. Both solutions can be disposed of as halogene-free organic waste. Out of metal and acid a nascent hydrogen is formed. It reduces the nitro to an amino group. Due to the nitrous acid, which is released by the sodium nitrite and hydrochloric acid, it becomes a diazoate and couples in a alkaline milieu with the existing anionic 2-naphthol to 1-phenylazo-2-naphthol, which is colored a deep red. The orange coloring after the addition of the nitrite solution is possibly due to the formation of 1-nitroso-2-naphtol. If one manufactures nitrobenzene oneself, then one has traced the path from petroleum fraction to aniline dyes, a classic and important industrial process. The mixture before the beginning of the reaction. The mixture during the reaction. The mixture towards the end of the reaction. Verification of anline as a azo dye.